Mars is busy, hyper and action-oriented. Mars is assertive, aggressive and competitive, while Neptune is spiritual, dreamy, imaginative, creative and has escapist tendencies. 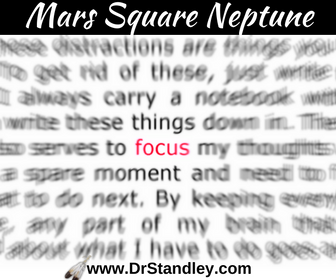 Mars square Neptune gives the ability to develop great creative power, but drugs and alcohol need to be avoided in order to be productive. Allergies to drugs or food intolerances may be present. This aspect is extremely sensitive to chemicals. This is an incredible amount of creative energy, as long as, you don't allow your mind to be tainted. You must be extremely protective over your mind and your own thoughts with this aspect. Keep in mind Mars is the ancient ruler of Scorpio, so if this aspect is not closely monitored it can lead to jealousy, insecurity, along with delusional and aggressive actions. Read more in my Astrology Aspects eBook - click the graphic below!